Have you thought how many things you throw every week that can be recycled? You can recycle paper, aluminum cans, plastic bottles, wood, tin, etc. Have you thought how many things you throw every week that can be recycled? You can recycle paper, aluminum cans, plastic bottles, wood, tin, etc. in order to save the earth. You just have to throw the recycled items in the respective recycle bins instead of throwing them into normal garbage bins. There are several benefits of recycling, out of which, you can benefit yourself by saving some dollars. Read on to know the numerous benefits of recycling. It saves earth - You will be astonished to know that recycling just about 35% of our trash can reduce toxic emissions equivalent to taking about 36 million vehicles off the road. Combustion of the solid waste is energy generating but it pollutes the air. So, by recycling certain materials, the emission of harmful gases can be reduced. Can earn dollars - There can be a number of things at your house, which you can recycle in order to earn dollars. You can recycle your ink cartridges, cell phones, and earn as much as $50 in return. By recycling aluminum cans, you can reduce the cost of waste disposal in your area, too. Helps build community - In every society, there is a growing concern of recycling and its effect on the environment. People are working together to create awareness to recycle certain items. So, people get to know each other and small communities are being developed, which is helpful for a society to progress. Effective way to conserve resources - Do you know that you can pour about 6 ounces of gasoline just by recycling 1 aluminum can? Yes, it is true. In the year 2007, the people in our nation have been successful in saving energy which is equivalent to about 15 million barrels of oil, just by recycling aluminum cans. 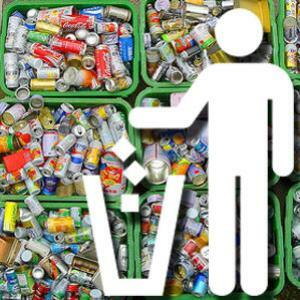 So, you can imagine how much energy can be saved by recycling more and more number of aluminum cans every year. Can create more jobs - Recycling is effective in creating more jobs in the country. Landfilling 10,000 tons of waste is able to create only 6 jobs whereas recycling the same amount of waste can create about 36 jobs in the country. So, recycling helps in economic development, too. Apart from putting the appropriate materials into recycle bin, you can use certain materials at your home for your benefit. For example, you can use the cardboard tubes of toilet paper and paper towel to wrap extension cords of Christmas lights and thus prevent them from getting tangled. Similarly, you can make new cards with the old Christmas cards and thus motivate your children to become creative, and in the process, save a considerable amount of money.